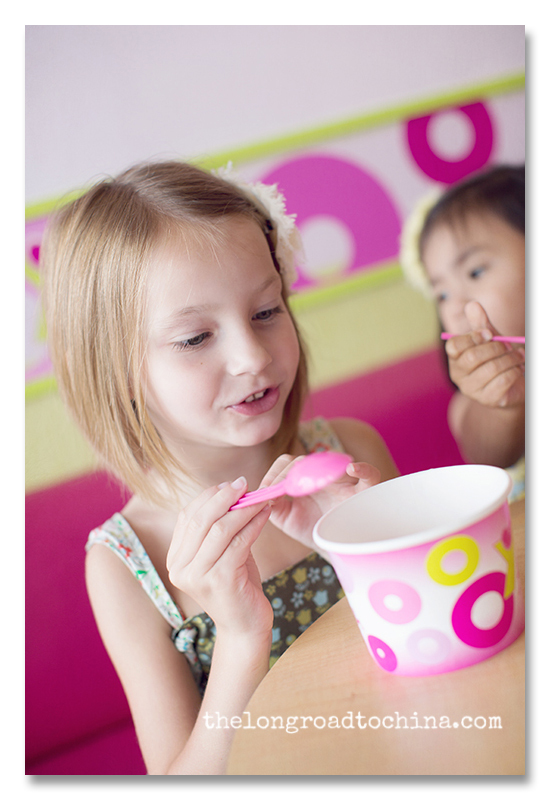 Within a few miles of our home, they opened one of those cool new Frozen Yogurt shops, where you serve yourself, choose your own toppings, weigh it, then pay for it! We could not wait to check it out and try some of the flavor combinations. 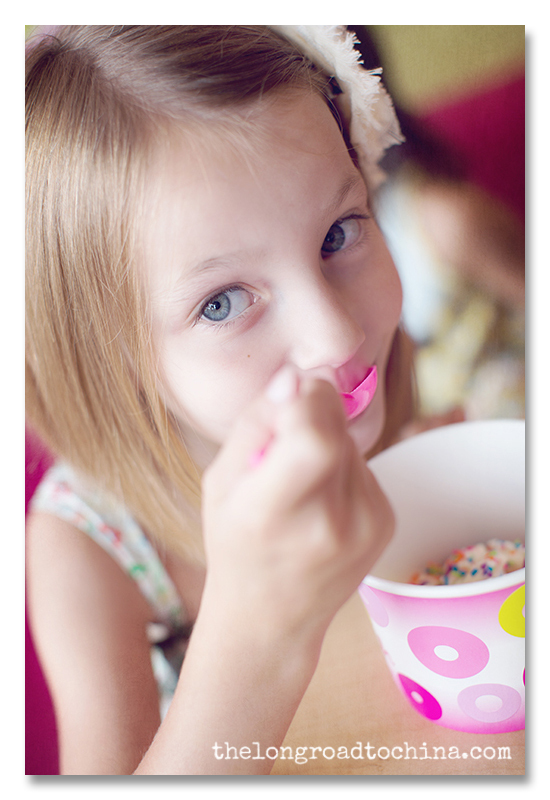 The girls played it safe with vanilla and LOTS of colored sprinkles. The cups are GINORMOUS....and this was the smallest available. Even our pickiest food critic gave this place the double thumbs up!! We are all completely addicted. I am embarrassed to say that we were there 3 times in one week..... Good thing they have some fat free varieties. My personal fav, is what they call fat free "Euro Tart", which tastes like a cup of original plain flavored yogurt. IT IS SO GOOD!!! I top it with fresh fruit; strawberries, blueberries, red raspberries, kiwi, and then add few crushed pretzels on top. You know I love my pretzels and ice cream...... in my book, there is nothing better!! 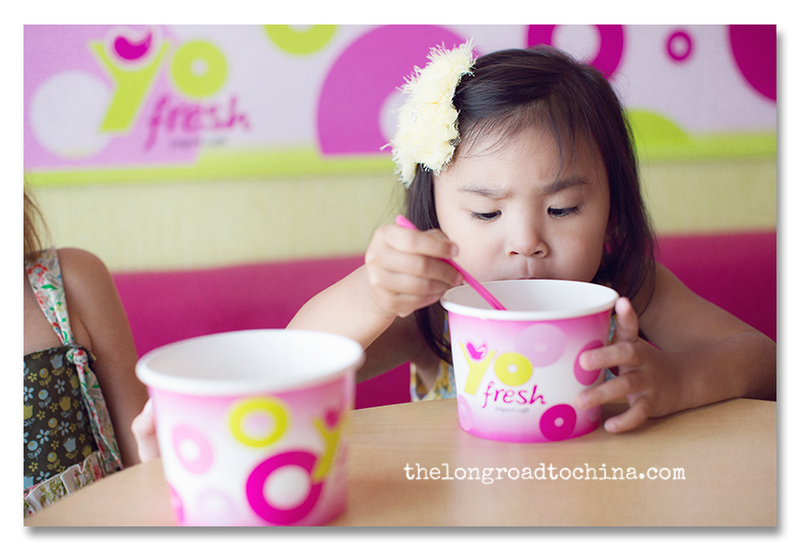 If you have one of these yogurt cafes in your area, be sure to check it out. They are definitely all the rage here..... the place has been jam-packed each and every time we have gone. Yum!! There is a place like this a 4 minute walk from my apartment, but the yogurt isn't very tasty. There is a much better one a few T stops away though, which is better for my waist line! doesn't Reagan have the most beautiful rosebud mouth? And Sarah's big beautiful blue eyes. You have two gorgeous girls there Lisa. The yoghurt looks good too, I'd probably avail of the huge cup, and be their ideal customer!! We got a fab new cafe/bistro 10 minutes walk from our house; in the space of 24 hours, I had dinner, the breakfast then lunch there! They joked that they would charge me rent!! "It's so important to support new businesses"- that's what I tell myself! Love the colorful presentation with your girls! Oooh -- that looks yummy!! We have a newly opened yogurt shop right around the corner from our apt. It's called THE YOGURT SPOT and it is ALWAYS jam-packed! I have been hesitant because of that alone. 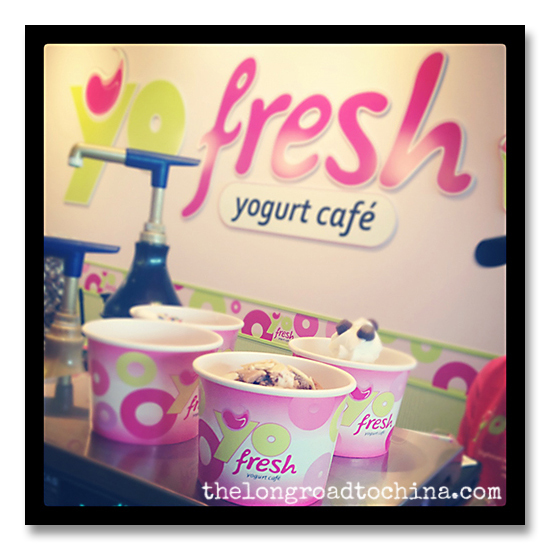 I may stop in and check it out because OH GOODNESS do Bre and I LOVE US SOME YOGURT! We have a couple of shops similiar to this. I always go for the fruit as well. Love your perspective on these. Works for me- I would be there all the time too!!! Looks like a great way to spend an afternoon! We have a few of these in my city and one relatively close by. I used to go regularly even in the winter time when my teeth chattered. I loved the "fat free" until one day I asked to read the label and saw the sugar content. My addiction came to a halt. We have these and cupcake boutique all over the place here. They are extra fun creating your own dessert! Waaay too cool that you can build your own treats. We don't have anything like that around here. And those colors are totally rockin'! This sounds really awesome! And your choice sounds really yummy! Love these. Looks so yummy! What fabulous pics. Looks so yummy. I linked up my own photos and I am now following you on GFC. Our version of this is "16 handles"...same deal, same addictive qualities! ;) sooooo good! We don't have those shops here but we do have one called "Pinkberry" which is excellent but I think they are way too expensive to have very often. Yummo! Love Reags' look of total concentration. SO cute and how fun are the colors of that place?!?! Great pictures you show of some adorable little girls. Love them, we have a new place called Menchies...been trying to remember the camera each time we go, but the boys protest to the yogurt photo shoot each time:) Have a great weekend. Your photos are amazing and capture such a simple time and pleasure! Looks delicious ~ maybe in London or some other big city, but frozen yoghurt is definitely not common place here in the UK. Wish it were!